Everyone knows that playing at home is a way to start the match with an advantage, but to what extent playing a game at your home stadium favours a team? To be able to appreciate the importance of the field factor we have analysed the results of all the matches of the five major European football leagues from 1970 to the present, and the overall answer is that in all these years, home teams have won 64.5% of the points and away teams, 35.5%. That is, home teams have managed to secure almost 2 out of every 3 points they have obtained. There are differences between countries that are never higher than 5 percentage points. France is where teams retain more points at home (67%), whereas in England is where they get less (62%). One of the first questions hanging in the air is whether or not the fact that in English matches visiting supporters usually occupy a significant part of the stadium can be related to this difference. If we chop up the figures by season, we find something we were expecting: the field advantage today is no longer what it used to be in the previous decades, and it is important to note that it has been going down over the last seasons. Overall, at the end of the 70’s teams retained almost 70% of home points, whereas in the last seasons this figure has come down even below 60%. Another thing that is obvious by looking at the first chart that accompanies this piece is that over the years the lines of the different countries have been getting closer, that is during the last seasons the differences between leagues have narrowed. These figures alone don’t provide any evidence, but probably most readers of this article will share the hypothesis that the gradual pacification of the stadiums over the years seems to have been a key factor in explaining this sustained trend. It is easy to think that the lower the level of violence in a stadium is, the more relaxed away players play and the less pressure referees feel when blowing for fouls, and that all of these help to balance the scale between the teams. On this basis, it is interesting to look at the chart for the figure of the final of the European Cup in 1985 between Liverpool and Juventus, played at the Heysel stadium in Brussels. The fights between fans before the match ended up with 39 supporters (most of them Italians) killed and around 600 injured. For the significance of the match, this is probably the biggest tragedy in a European football stadium due to fights between supporters. 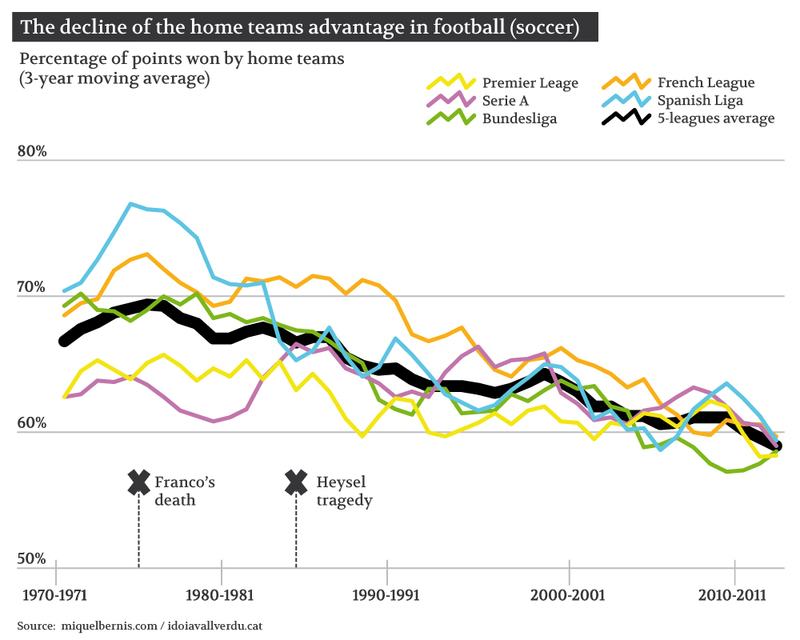 Interestingly, during the years after the Heysel disaster it is in the English football league where more teams fail to win at home, but in general the downward trend accentuates over the next decade. There is one last aspect that is striking in the chart: the country and the period in which winning away is more complicated is in Spain during the transition. There is a clear peak around the year of general Franco’s death, and that has to make one consider whether or not a period of social upheaval and instability like that one could have had an indirect influence on the fact that home victories were easier. So far we have been talking about violence, but if we asked ourselves why is it easier for teams to win at home, probably most of us would reply that it is due to a mix of the effects of the public on the players and referees, the difference in size or the grass that may exist between one stadium and another, or even perhaps we would add the weather. 4 years ago, the journalist Jon Wertheim and the economist Tobias Moskowitz resolved themselves to clarify precisely the reasons behind the field factor in their book Scorecasting: The hidden influences behind how sports are played and games are won. From the statistical analysis of different data sets in various sports they came to the conclusion that the responsibility falls primarily on the referees. 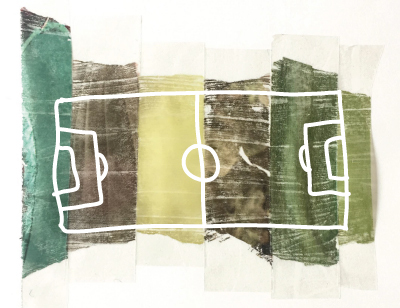 According to them, nor weather, nor traveling, nor fields affect the results, and even the effect of the supporters on the away team is not significant. Actually, that’s what the next post will talk about. 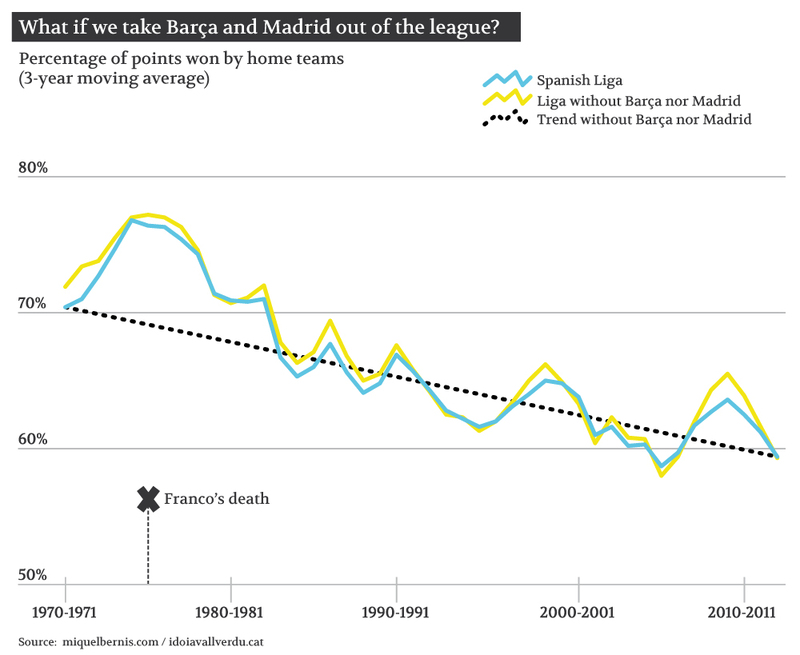 NOTE: A reader comment when the article was published suggested that the drop on the home field advantage in the Spanish football could be related to the increasing gap between the two main teams (Barça and Madrid) and the rest. That was easy to check, filtering all the games on which Barça and Madrid are involved, and so getting a league without them. The result is a very similar graph, without Barça nor Madrid, the home field advantage would have also declined. On the comments I was also asked about the change from 2 to 3 points per win, I indeed took this into consideration, as well as paid attention to the difference in the year it was applied.